I spent a few days in Puerto Rico last month. A quick in-and-out for work, there was little chance to do any real exploring. Nevertheless, I booked my return on the last possible flight out so that I would have at least part of a day to look around before needing to go to the airport. I’ve only been to Puerto Rico twice before—once in 1982 on a one-day visit during my honeymoon cruise (with a far-too-rushed guided tour to El Yunque), and again in 1999, also a quickie for work. Given my limited previous opportunities to explore San Juan, you might think I would choose La Forteleza and San Juan National Historic Site in Old San Juan for my day’s destination. After all, they were designated a World Heritage Site by UNESCO (United Nations Educational, Scientific, and Cultural Organization) in 1983. Tempting, but when I looked at the map of San Juan a nice, big, chunk of green immediately caught my eye—Bosque Estatal de Piñones (Pine State Forest). Call me single-minded, but not even a World Heritage Site can match the siren call of 1,500 acres of moist, subtropical forest! Mangrove forest covers much of the reserve, accessed by a wide (and annoyingly elevated) boardwalk—an interesting stroll but unsatisfying to me since I couldn’t root around at ground level. One can get only so much enjoyment from distinguishing red, black, and white mangrove before the sameness of the canopy and exclusion from the ground flora/fauna starts to become monotonous. I went back towards the parking lot (photographing a few lizards along the way—more on them in a future post) and had just begun walking the perimeter of a picnic area when I encountered some very large seagrape (Coccoloba uvifera) plants. I’ve seen a lot of seagrape in Florida and have never found any insects on it, so I initially didn’t make much effort to go over and have a closer look at them. However, even from afar I could see that these particular plants had been very heavily damaged by some type of defoliating insect. The first few branches I looked at showed no outward evidence of who the culprit was, but I reasoned it must have been some sort of lepidopteran caterpillar. As I was inspecting the branches, the insect in the above photo caught my eye—at first I thought it was some type of “homopteran” because of the apparent egg-guarding behavior it was showing, but a closer look revealed that it was actually a sawfly! An egg guarding sawfly; who would have thought?! Female ovipositing her clutch of eggs, which are solid red when first laid. Predictably, subsequent identification was quite easy as there is only a single species of sawfly in Puerto Rico—Sericoceros krugii in the family Argidae. About 20 species make up this Neotropical genus, occurring from southern Mexico south to Argentina; however, S. krugii is the only species occurring in the West Indies and in addition to Puerto Rico is found in the U.S. Virgin Islands and Dominican Republic (Smith 1992). The species in this genus seem to specialize on Coccoloba spp. (family Polygonaceae) as host plants; however, one species is reported from Triplaris caracasana—also in the Polygonaceae (Smith & Benitez Diaz 2001), and another from Lonchocarpus minimiflorus in the family Fabaceae (Smith & Janzen 2003). 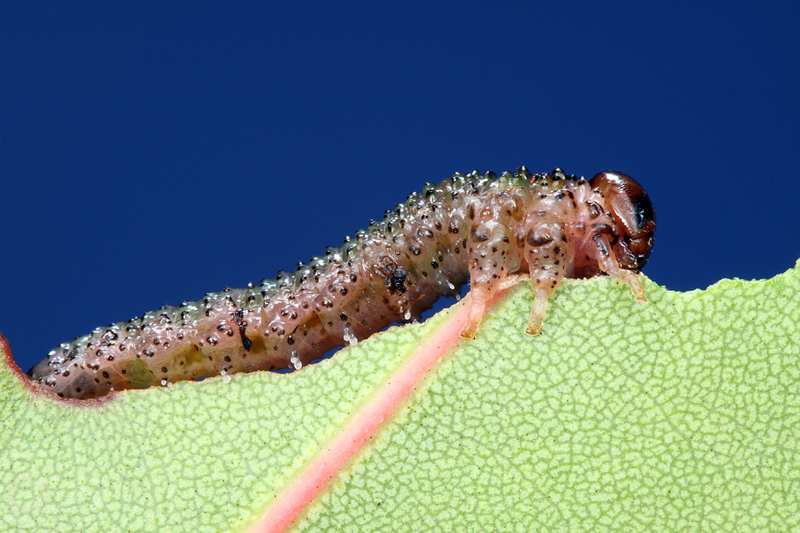 Larvae consume all but the largest veins of the foliage. Wolcott (1948) describes how this species often defoliates long stretches of seagrape on the beaches of Puerto Rico, leaving “windrows of excrement on the sand underneath the naked branches and leaf midribs…” He also describes its apparent lack of natural enemies (although it has since been recorded as a host for a tachinid fly—Bennett 1999) and the fact that birds do not seem to eat them as possible reasons for its abundance and frequent outbreaks. To me, the screaming red/black coloration of the adult and apparent unpalatability to birds suggest the presence of chemical defenses, and although I couldn’t find any information on this specific to Sericoceros spp., many social species of sawflies are typically well-defended chemically and, thus, aposematic. 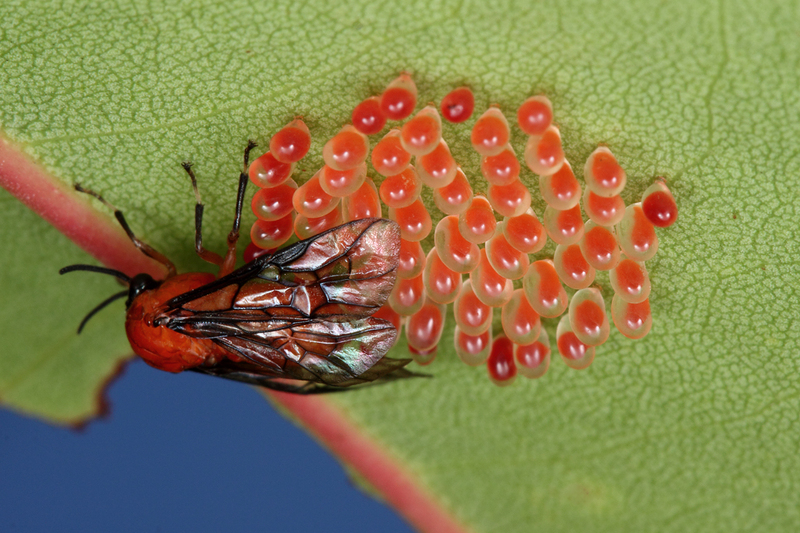 Despite this apparent defensive capability, the remarkable maternal guarding behavior exhibited by the adult females suggests the eggs still need additional protection from predators and parasitoids. Sericoceros spp. 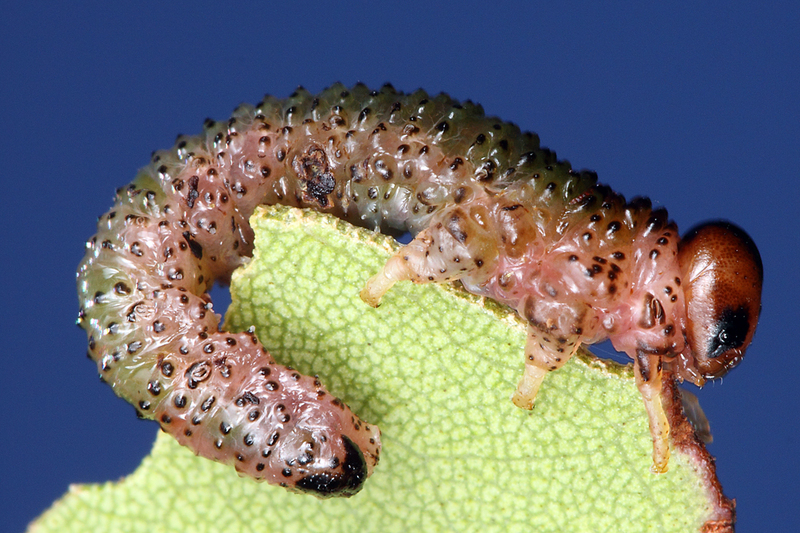 are not the only sawflies to exhibit this behavior, which apparently has evolved across numerous sawfly lineages (see Social Sawflies, by James T. Costa). This mature larva will soon spin a coccoon on the bark for pupation. There were only a few, apparently mature larvae still around on the trees that I could find. Wolcott (1948) describes most outbreaks as occurring during the fall and winter months, after which the insects might completely disappear for many months or even a year. I must have caught the tail end of one such outbreak, although the number of females that I saw guarding eggs suggests another wave of defoliation would soon be occurring. Congratulations to itsybitsybeetle, who showed up late to the party but still managed to pull out the win for Super Crop Challenge #13. Brady Richards came in a close 2nd, while Sam Heads and Mr. Phidippus share the final podium spot. The overall standings remain the same, with Sam leading Brady by a single, slim point and Mr. Phidippus only six points further back. There will be two more challenges in BitB Challenge Session #6, so it’s still possible for somebody to make a late run, especially if one or more of the leaders falters down the stretch. Remember—the top three points earners at the end of the session will get a choice of some loot, so don’t hesitate when the next challenge rolls around. Bennett, F. D. 1999. Vibrissina sp. (Diptera: Tachinidae) a parasite of the seagrape sawfly Sericoceros krugii (Hymenoptera: Argidae) in Puerto Rico: a new record. Journal of Agriculture of the University of Puerto Rico 83(1–2):75–78. Smith, D. R. 1992. A synopsis of the sawflies (Hymenoptera: Symphyta) of America south of the United States: Argidae. Memoirs of the American Entomological Society 39:1–201. Smith, D. R. & Benitez-Diaz. 1991. A new species of Sericoceros Konow (Hymenoptera : Argidae) damaging villetana trees, Triplaris caracasana Cham. (Polygonaceae) in Paraguay. Proceedings of the Entomological Society of Washington 103(1):217–221. Smith, D. R. & D. H. Janzen. 2003. Food plants and life histories of sawflies of the family Argidae (Hymenoptera) in Costa Rica, with descriptions of two new species. Journal of Hymenoptera Research 12:193–208. Wolcott, G. N. 1948. Insects of Puerto Rico. Journal of Agriculture of the University of Puerto Rico 32(4):749–975. This entry was posted in Argidae, Hymenoptera and tagged chemical defenses, entomology, insects, nature, predator avoidance, Puerto Rico, quiz, sawflies, science, Super Crop Challenge. Bookmark the permalink. When I lived in Belize, the sea grape tree in our garden was protected by an ant colony, which may be one of the reasons why they usually do not have large amounts of insects on them! I found some different insects on seagrape at another spot along the coast – I’ll do a post on them sometime soon. The ants on my tree were carpenter ants, and they milked aphids, which is why the tree was so heavily guarded. I had no idea what the answer might be when I saw the challenge photo. Very cool to see that some sawflies guard their eggs. The adult reminds me of some of the day flying moths. Yes, I see the resemblance now that you mention it. No coincidence that those moths are also chemically protected. Nice photos. The eggs look like pomegranate. Sorry to hear all your visits to Puerto Rico have been rushed. Hopefully next time you’ll have more time. Pomegranate – that’s a good one! Great sawfly, I’ve still yet to see an argid alive, so colour me envious. The maternal guarding may be aimed at egg parasitoids or at fungi. Tropical opilionids and centipedes that egg-guard seem to be mostly interested in the microbes. Very nice, Ted. 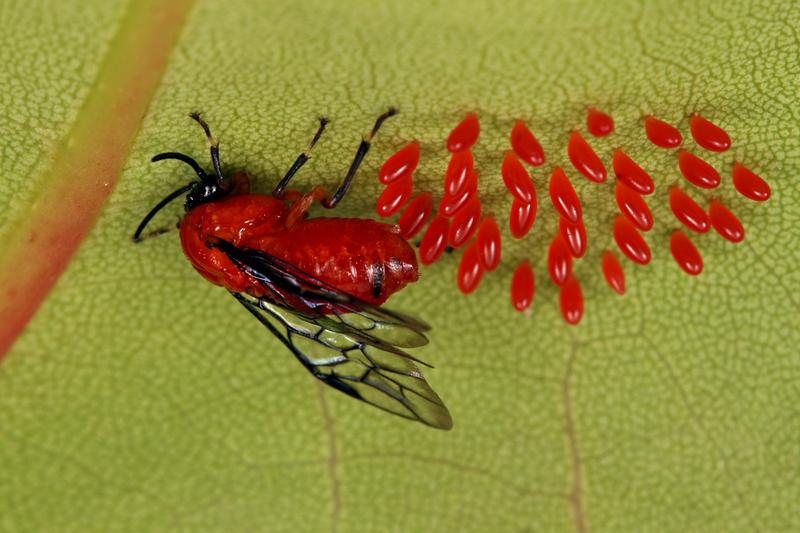 I was thinking bug eggs of some sort, but the answer turns out to be much cooler!